This decedent pomegranate curd recipe can be used as a filling or spread. With the help of sous vide, you can make smooth as silk pomegranate curd. If you are loving this curd recipe you need to try my recipes for blood orange curd and lemon curd both are made with the sous vide cooking method. Pomegranate curd is a delicious blend of tart pomegranate juice delicately cooked to a custard-like mixture made from pomegranate juice, sugar, butter, and egg yolks. My sous vide pomegranate curd recipe is cooked in mason jars.The sous vide will keep the ingredients at a constant temperature, cooking the curd smooth as silk. 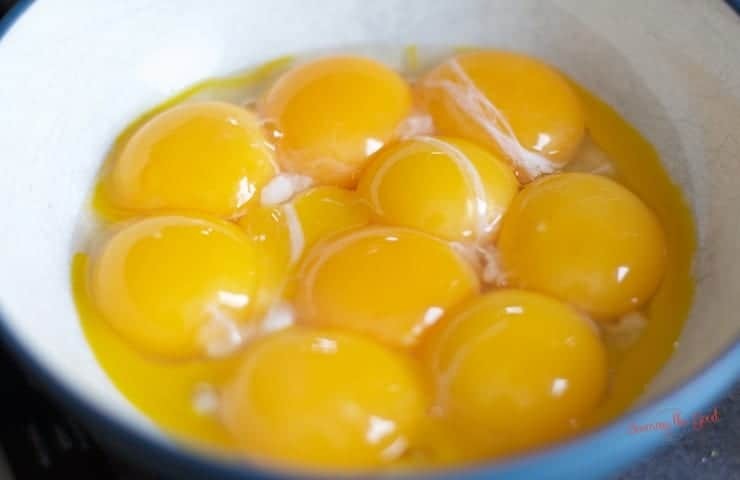 Separate 10 yolks from their whites. Save the whites for another recipe. In a food processor, blend the sugar until the sugar is a fine powder. With the food processor running, pour in the 1 cup pomegranate juice. Then, add the egg yolks, one at a time allowing each one to incorporate fully. While the food processor is will running, pour the melted and cooled butter into the yolk/juice mixture. Fill half pint jelly jars with the pomegranate curd mixture. If there is still a bit of foam or bubbles on the top of the curd, and it bothers you, firmly rap the jars on the counter to pop the bubbles. Or you can use a kitchen torch to quickly remove them. Place a lid and ring on top of the jars. Make them finger tight. A delicious variation of sous vide cheesecake is this easy recipe for grasshopper cheesecake. These cheesecakes in jars are perfect for portion control or for a dessert bar at a reception or your next holiday party. Sous Vide peanut butter cheesecake in jars features a pretzel crust and a chocolate ganache with crushed pretzel garnish. This is one of my favorite sous vide cheesecake recipes because peanut butter, pretzels and chocolate just belong in the same jar together! A delicious variation of sous vide cheesecake is this easy recipe for turtle cheesecake.The sous vide technique ensures that you will never have a dry or cracked cheesecake again! This sous vide creme brulee recipe is practically foolproof. There are four creme brulee ingredients in this easy creme brulee recipe. Follow these simple instructions for the creamiest creme brulee ever. Seriously, the silkiest pomegranate curd! There was no need to pass this through a fine mesh strainer to get our any coagulated egg bits. When the jars are first opened they might have a bit of foam on the top. This is not a big deal, do not be alarmed. Simply give it a gentle stir and the foam incorporates into the rest of the curd. I found this to be the best eggnog recipe. Sous vide eggnog is the easiest way to get perfect homemade eggnog every time. This is a spiked eggnog recipe but it can easily be made with out alcohol. Sous Vide hollandaise is practically fool proof. With the help of sous vide this easy hollandaise sauce recipe is prefect for spooning over eggs Benedict, asparagus or salmon. How do I use fruit curds? Eat it off the spoon, pour into a tart shell, use it in the filling in macarons but enjoy and savor this sous vide pomegranate curd recipe.